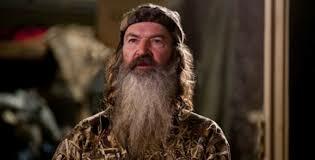 Phil Robertson (the Duck Dynasty Daddy) put himself in a world of hurt with comments he made in a GQ interview regarding his thoughts on homosexuality, and his network, A&E, responded by putting him on indefinite suspension. I’m frustrated by his network’s decision – I think it’s disingenuous and cowardly. The entire reason a magazine like GQ wants to interview a guy like Phil Robertson is because they hope he will say things their readership will find crazy and outlandish. He has a show because he is different and unpredictable, and none of the people making money from that show, or interviews like this, want him to switch to being politically correct. A&E calls his suspension a demonstration that his statements do not reflect the position of the network. Which begs the question: Why would anyone think that they did? This is a man who bites live snakes in half – do they agree with that? Did his choice in that particular moment reflect the network’s position on the care and treatment of reptiles? Of course not. In the bigger picture, the network is being shortsighted: this suspension opens them to the suggestion that every comment made by their talent that they don’t censor does reflect their position on various issues. Good luck with that. They’d be smarter to point to the First Amendment, admit that we all have the right to say a WIDE variety of things in this country, and use this as an opportunity to start a conversation, rather than make a knee jerk reaction that I suspect is just a red herring to get more people talking about the show. On a more personal note, it bums me out that as a nation that talks endlessly about the gift of diversity and how sharing our different beliefs is a way to build connections with people who aren’t just like us, we never mean guys like Phil, who aren’t inviting us into a circle to sing happy songs, but raising challenging opinions many disagree with…but doing so in a calm, respectful way. Like it or not, Phil is part of our diversity. He’s at the table. And what we do at the table – when we’re at our best – is talk, and listen. We disagree. We ask questions, and fight back the urge to jump to conclusions. And usually, we learn that there’s way more to most of us, and what we think and believe and value, than can be captured in a few interview sound bites. This entry was posted in Perspective and tagged A&E, Duck Dynasty, Phil Robertson on December 19, 2013 by Trish Ryan. I completely agree. It seems like if you disagree with what is rapidly becoming the majority, you’re a bigot/racist/whatever. And that’s not open-minded or accepting at all. Very hypocritical. So frustrated by this and I don’t even watch the show! Great post. Wish A&E would read this and maybe they will! !